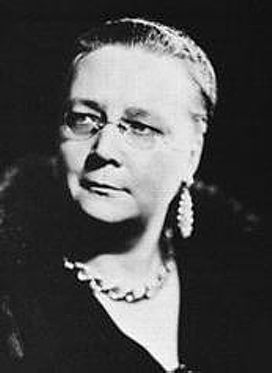 Renowned for her entertaining crime novels, author Dorothy Sayers also wrote plays, poetry and essays on Christianity. She is held in special regard in the Fenland village parish where her father was Rector. Dorothy Leigh Sayers is best known as a writer of detective stories, especially those featuring the amateur aristocratic sleuth, Lord Peter Wimsey, and Harriet Vane. She was born in Oxford in 1893. Her father, Henry Sayers, was a priest and headmaster of Christ Church Cathedral School. Shortly afterwards, he became rector of Bluntisham, and it was here, on the edge of the fens, that Dorothy had her childhood home, seeing the life of fen people, who had to survive the rise and fall of the water levels in the nearby New Bedford River and the Great Ouse. Here, too, at Bluntisham Church on one occasion she saw the bells lowered for restoration. It is said that the records of the bell foundry include an account of a young girl at Bluntisham who kept questioning the workers about the bells, and it is tempting to think of this as the adolescent Dorothy. She studied hard and in 1912 went to Oxford to read Modern Languages at Somerville College. Women were not allowed to take their degrees until 1920, and Dorothy Sayers was among this first group of women to receive an Oxford degree. She joined a London advertising agency where she collaborated with the artist John Gilroy to create “The Mustard Club” for Colman’s Mustard and the Guinness “Zoo” advertisements, variations of which still appear today. One famous example was the Toucan, his bill arching under a glass of Guinness. It was while working there that she conceived of Lord Peter Wimsey, and her first novel was published in 1923. 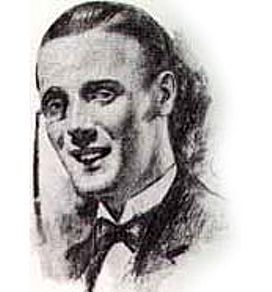 Wimsey, with his monocle and somewhat foppish air, appeared in eleven novels and several short stories. For fourteen years she continued to write novels and short stories. One of the books, The Nine Tailors is set in the fens, with a church with an angel roof – such as those at St Wendreda’s in March or St Peter’s at Upwell – playing a prominent role. One character is a teenage girl who sits in the bell chamber asking questions. Her personal life was complicated by the birth of an illegitimate son, whose very existence she hid from her parents and the outside world. He was cared for by her cousin, though Dorothy was able to finance his upbringing. She later married a divorced journalist. Both these acts were somewhat frowned upon in the society of the time, especially within the Church. However, she was a convinced Christian, a lifelong member of the Church of England, and having achieved financial independence, she turned from fiction to religious writing.